In an interview with the Dailymirror, assistant leader of the United National Party (UNP), Parliamentarian Ravi Karunanayake said that the Opposition was confident of a victory at the upcoming Presidential Election with their candidate, Maithripala Sirisena, the ex-minister of health and the former general secretary of the SLFP. He added that the party’s own general secretary leaving the UNP and joining the Government was not a set back at all to the Opposition. 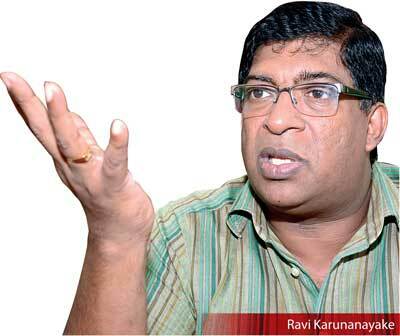 Why did the UNP decide to bring in someone from the SLFP as the Common Opposition candidate? It is a common objective that needs to be obtained. And the objective – abolishing of the Executive Presidency – is something temporary. As a result, it will be a re-conciliatory approach. This is the reason we looked at the merits and the demerits before deciding on what was necessary to bring a sure-case victory. So we looked at the strength of the UNP and the other alliances and we thought that the topping-up effect is the best approach to make sure of a victory. We are going against acrimonious politics to re-conciliatory politics. You should satisfy the people that all the major forces are working together. So with that, the best choice was a common candidate to execute the functions in the next 100 or less days. Thereafter whoever gets elected would be the head of State. Didn’t the UNP have a suitable contender within the party to come forth as the common candidate? The UNP is the biggest party and have certainly looked at the situation from a point of sacrifice for the collective good of the country. However, there have been many misinterpretations [of this theme] so everything was put to rest. We have made a short-run sacrifice before the long haul which will benefit the country through a new political culture and a national government. Various parties in the Opposition have different ideas on constitutional reforms. Has the UNP reached a consensus with the other parties in the Opposition as to how this should be done? Yes, there is definitely a sense of consensus and consistency in the approach of this heterogeneous get-together. We have four major priorities – abolishing the Executive Presidency, restoring a first-past-the-post Parliamentary Election system, bringing good governance to the country and economic revival. These are the fundamental objectives of our coalition. Different people will have different policies, but we are getting together to counter a national crisis created by one party – the Rajapaksa government. These fundamentals reflect the minimum to resuscitate the lost democracy in the country. One of the Opposition’s main goals is to abolish the Executive Presidency and bring back the [former] parliamentary system. But don’t you think this would pave the way for the LTTE to rise again and bring in a fresh threat of terrorism? I am happy that you are talking in the language of the Government. But, let me answer that in full. This is the latest myth the bankrupt Government is spreading that there is a possibility for the resurgence of terrorism. What nonsense is this? We have Sarath Fonseka on our side who basically crushed terrorism. We have Mr. Sirisena as the common candidate who the LTTE tried to kill on five occasions. Then we have Chandrika Kumaratunge who paid a price with her eye and nearly lost her life supporting the same concept. Then we have Ranil Wickremasinghe who tried to bring in a sense of democracy by bringing the two sides to the negotiating table. Then we have Jathika Hela Urumaya (JHU) – Rathana Thera who has been playing a magnificent role, Champika Ranawaka who has shown his maturity in politics. Then we have Arjuna Ranatunge who is a Sri Lankan cricketing star. Are you saying these types of people will help to bring back terrorism? On the other hand, who are the ones who are supporting these terrorists? 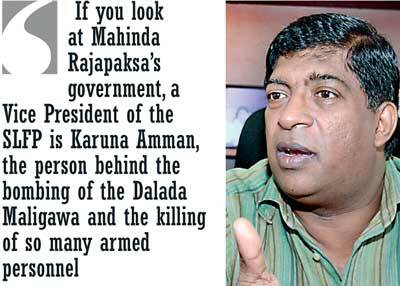 If you look at Mahinda Rajapaksa’s government, a vice president of the SLFP is Karuna Amman, the person behind the bombing of the Dalada Maligawa and the killing of so many of the armed personnel. Then there is Pillyan who is an advisor to the president. Then they have KP who was involved in funding the killing of 70,000 armed personnel and also ordinary people. He is also wanted by India. But they are basking in luxury provided by the Government rather than in custody. Furthermore, just look at the actions of the Foreign Ministry. You have the proscription of the LTTE and this Government did not even engage counsel to ensure that the proscription remained. Then you have the task of reconstructing our embassy in Geneva given to LTTE sympathisers. These are hypocrisies of the Government and they have the audacity to point fingers at us. This government wants terrorism rather than anybody else. The main problem is misinformation. Rest assured, this type of question need not to be asked from the Opposition anymore. Instead you will have to ask the Government what they are doing with all these terrorists. But, remember that every Tamil person is not a terrorist. Tamil people should be respected as people. I saw a news item recently that the President was going to prune some of the executive powers. Then what? Why should we believe that when he has not done it over the past 10 years? He is trying to fool the people once again. You can fool some people all the time and all the people sometimes but you cannot fool all the people all the time. This is too little, too late. Some experts – legal and political analysts - have claimed that it is not practical to reform the Constitution in 100 days or less. Do you think 100 days are enough? All I can say is that we followed the legalities and that we have been ready for the last 10-12 years. It is the merging of ideas that needed time. Now we have merged those ideas. So once Mr. Sirisena becomes the President on January 8 and he is sworn in, he will recall Parliament and gazette the intended reforms [for the information of the public]. We are following legalities as this Government did, when they brought in the 18th Amendment. It is the Government that is saying this cannot be done. They sacked the CJ in 24 hours and they brought the 18th Amendment in less than 72 hours. If they can vilify people’s power and arrogate powers to one executive in less than 100 hours, why can’t we bring in our reforms in less than 100 days? So, there’s no need to challenge us on the credibility and the legality of our proposal. If it is required, we will even go for a referendum. In order to bring the Constitutional reforms the Opposition needs a two-thirds majority in Parliament. Do you think [ a two-thirds majority] is possible to achieve? Well, the will of Parliament is definitely for a change. Remember, in page 84 in the Mahinda Chintana, it is mentioned that the Executive Presidency will be abolished and the parliamentary system brought back. This government is in Parliament to do that. But, their solemn pledge made to the people in the Mahinda Chintana was overruled by one person – President Rajapaksa. And the promise to the people is forgotten! We are only reminding the MPs they were elected for that purpose, otherwise the Parliament is of no value. Today everybody wants to abolish the Executive Presidency. Who wants to keep it? The Opposition say the same, the other parties say the same, and people who got elected to Government are also for it. So what is this two-thirds talk? These are the talk of people who couldn’t do it for five years or in 10 years. When you see the changes in the next couple of days, you will see how close we are to achieving this target. Yes, of course. Everybody has their conscience pricking them and they would come in [ cross over to the Opposition] at the opportune moment. What we heard was that ministers and MPs who were ready to crossover have changed their minds or have been held back in various ways. That is what the Government says; they are Government stories. As soon as they said no-one would crossover, one minister joined us the next day. So, likewise we will give that element of surprise. At the moment, the Government has destroyed all political parties. Now it is their turn to get that in return. They thought they were the kings, destroying all political parties at their whims and fancies. And they thought they were impregnable from suffering a similar fate. We are not doing this is in acrimony, we are doing this for the sake of preserving a flickering democracy in the country. Speaking of crossovers, don’t you think that the General Secretary of the UNP, Tissa Attanayake leaving the party and joining the government is a setback for the UNP and the Opposition? It’s not a setback at all. We knew he was going to leave. During election time people come and go but those who leave the Opposition and join the Government will not be accepted by the public. If someone leaves the Government and joins the Opposition that is because that person is unhappy with the conduct of the Government and wants a change. But if someone leaves the Opposition and joins the Government, he is doing that for personal gains – basically for the greed of power and money. We have appointed Mr. Kabir Hashim as the new General Secretary of the UNP and this is a role he has been fulfilling even before this. What about the support of the Janatha Vimukthi Peramuna (JVP)? The JVP has clearly stated that they want Mahinda Rajapaksa defeated. So where else can their vote go? Clearly, you see them supporting the common candidate. It is apparent to anybody that their intentions are sincere. The Common Alliance consists of parties and individuals with whom the UNP has been at loggerheads in the past. Now the UNP is accepting them. What has changed? Politics is the art of ‘Possibility on behalf of the people’. Consequently, Mahinda Rajapaksa did not have the support of the people he bought over to makeup the two-thirds majority in Parliament. Those bought were against him. Ours is not a hypocritical alliance; but an alliance on behalf of the people. Many view the alliance with Chandrika Kumaratunge as a dangerous one. Why did the Opposition decide to join hands with someone the UNP has vehemently criticised in the past? You require all the forces that is there. Who is left with Mahinda Rajapaksa? It is his family, the Bodu Bala Sena, Wimal Weerawansa and Dinseh Gunawardene. Who else is there apart from the spare wheels that have been left out of all political parties? But spare wheels that have been bought over don’t constitute a party. We have the genuine UNPers. Maithirpala has a following of genuine SLFPers politicians and genuine party supporters to add on to the genuineness of our alliance. Aren’t you worried that the country will go back to what it was before? The country has gone a long way far back, but we can take it forward. How far back can you go? Today, the media is suppressed to a great extent. The situation of the judiciary is also clear from the answer that was given on the ‘Third Term’ issue without a referendum. Then look at the human rights situation and the economy which is in dire straits. You cannot get any closer to disaster than this. Earlier, you mentioned that one of the priorities was a revival of the economy. How do you plan to do this considering the current debt situation of the country? Economic revival should not burden the people. Currently people are suffering because of Government mismanagement and corruption. What we need to do is to reduce the cost of inputs and concentrate on local resources rather than depending on foreign resources. Recently in an interview, Minister S.B. 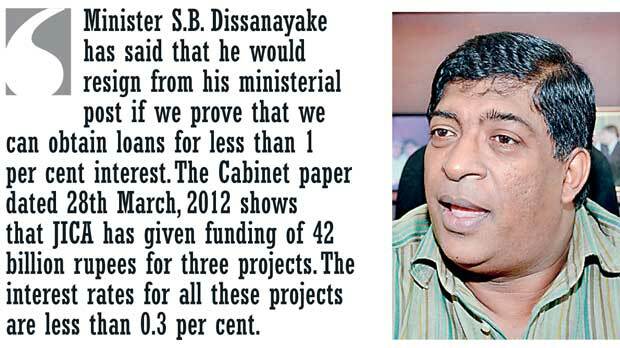 Dissanayake has said that he would resign from his ministerial post if we prove that we can obtain loans for less than 1 per cent interest. I have documentation to prove that we in fact can obtain loans at interest rates lower that 1%. The Cabinet paper dated 28th March, 2012 shows that the JICA has given funds amounting to 42 billion rupees for three projects. The interest rates for all these projects are less than 0.3 percent. So the loans are available at cheaper interest. The question is whether you want it or not. The external costs should be converted to internal benefits in order to revive the economy. We need to revive and bring back Sri Lankan businessmen – and I don’t mean casino kings, drug barons and prostitute bosses. Most importantly, we need to depoliticise the economy and become more professional. How is Mr. Sirisena’s election campaign going? The campaign has kicked off. You can see a bottoms-up approach in this campaign. Unlike the Rajapsaka government, we are doing a campaign through the hearts and minds of the people. Mr. Wickremasignhe and Mr. Sirisena are handling the campaign together with the other party leaders. It is a combined council. What we want to do is a sincere, pure, serene campaign; it is not a witch hunt. We want to develop a new political culture. Look at the vulgar display of funding in the Government. There are 400,000 lamp posts in the country and there’s hardly one that doesn’t have a poster bearing the face of Mahinda Rajapaksa. Only weak products need to be marketed over and over again and that is what has happened to the Government. If it is a good product, you only need to give a timely reminder. Realistically speaking, do you think Mr. Sirisena can secure a victory against President Rajapaksa? With the greatest of ease. We are confident of the people. We don’t want to be arrogant like the Government. What we want to tell the people is that fate is before them. It is the people that have got to ensure that they are with us to protect the country. The question is whether it is to protect one family or protect the nation. We have abundant confidence that the will of the people would be reflected with an astounding victory for Maithripala Sirisena. We are wining and we are going forward.